As a coach, you strive to find the words that will help your athletes reach their full potential—not only as athletes, but as young adults. Here are a a few brief motivational messages that coaches have used in motivating their athletes to get the most out of their athletic experience. In an article in Psychology Today, Meg Selig—author of Changepower! 37 Secrets to Habit Change Success—provides a few brief motivational messages that coaches have used in motivating their athletes to get the most out of their athletic experience. Do you work with female athletes? 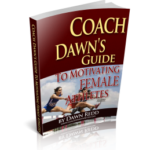 Here is a great resource from Coach Dawn Redd-Kelly that will help you motivate female athletes.